*Editors Note* This blog was updated 2/20/19 to reflect current models and technology for 2019. During my 15 years working in Industrial Automation & Data Collection, I have gained a solid grasp for specific hardware solutions that exceed application specification requirements and provide the ultimate level of performance on the manufacturing floor. Due to the ongoing need for a customizable and cost-effective solution based on quality and longevity with the end goal of platform standardization in mind, I wanted to provide you with an updated look at the 5 Types of Industrial PCs that Provide Ultimate Performance on the Manufacturing Floor. Whether your area of expertise is in IT, Engineering, Test & Measurement, Software, QA or Management, there are a myriad of 2U to 7U and 5-slot to 20-slot solutions available for custom configuration and use in Pre-Assembly, Manufacturing, Visual Inspection, Final Assembly, Test & Measurement and Traceability. The most commonly utilized are the Advantech HPC-7320MB 3U Compact Rackmount Chassis with ATX Motherboard, the ACP-4000 4U Rackmount chassis with ATX Motherboard or PICMG 1.0/PICMG 1.3 14-slot Passive Backplane/Single Board Commuter and the IPC-6608BP 8-slot Wall mount/Desktop Chassis with PICMG 1.0/PICMG 1.3 14-slot Passive Backplane/Single Board Commuter. There are many other chassis options available, depending on available space, CPU, RAM/Storage needs, I/O Card and power requirements but the three solutions listed above seem to be the most prevalent for installations. At this point, you may be asking yourself why this is the case? I’ve found the following to be accurate. The 3U Compact Rackmount PC provides the I/O expansion of a 4U Rackmount PC but will fit in spaces that a 4U Rackmount PC can’t. The 4U rackmount PC remains an Industry standard, constantly utilized with pre-fabricated 19” cabinets and in 19” racks and when space is at a premium, the 8-slot IPC-6608BP PC possesses the I/O expansion, power and configuration flexibility to successfully operate anywhere on the manufacturing floor. Where PC implementation space is at a minimum, an Advantech fanless Embedded Automation PC is a great selection. These I/O-intensive units vary in form-factor from Din-Rail, to Standmount, Wall mount & Rackmount, providing numerous I/O configuration and iDoor expansion capabilities, depending on your LAN, USB, COM and Video requirements, along with any additional requirements for Wi-Fi, Bluetooth CANopen, PROFIBUS, PROFINET, EtherCAT, EtherNet/IP and POWERLINK. For applications where vibration, shock, dust and other Industrial factors are prevalent, the UNO Embedded PC is a great choice due to its compact fanless design, seamlessly with mSATA, Solid State and Compact Flash drives, -4 ~ 140°F operating temperature and IP40 rating . 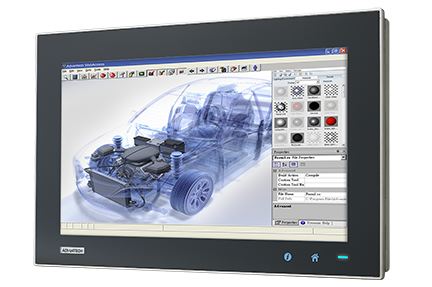 If HMI is required, you can add a standard or wide screen multi-touch Flat Panel Monitor with integration mount for implementation as a fully industrial unit for operator interface. If a fanless all-in-one Control Panel, Web-Browser Terminal, Industrial Thin Client, Operator Panel or Domain Focused HMI is what you are looking for, an Advantech Touch Panel Computer is a great choice. Models continue to range in size from 3.5” to 21.4” and are available in wide screen and multi-touch interface. For applications requiring fewer LAN, USB & COM than some of the larger Embedded PCs, you really can’t go wrong. For those who crave furthered versatility, the newly launched Advantech Modular Series offers furthered versatility by providing two Computing Box options with differing processing and computing power. Advantech’s Modular Box, combined with a 21.5”, 18.5”, 17”, 15” or 12”display now enables the user to standardize on a common PC, while providing multiple display options. The largest usage for this PC is for SCADA implementations that include customized software and directly interface with a PLC, external I/O and peripherals. For the most rugged applications such as milling, CNC machines, glass production, injection molding, grinding etc. where severe vibration and ingress is prevalent, an IP65 NEMA rated the Panel PC is still your best bet. 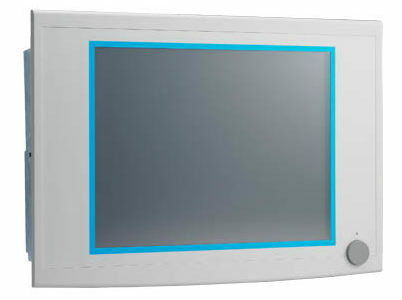 Panel PCs provide the same performance as a Touch Panel Computer with 6.5” to 21.5” display options, optimal processing power, memory storage capabilities and I/O accommodations but also include a ruggedized bezel with die cast aluminum alloy enclosure. 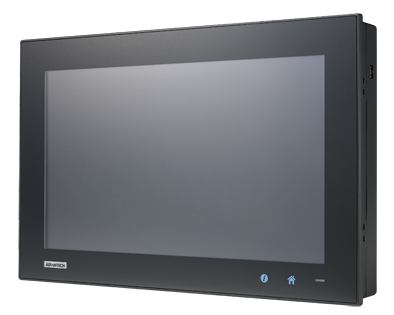 With IP65 compliance, enhanced performance, robust I/O and wide screen multi-touch options, the Advantech Panel PC remains a great value for any Industrial user looking to implement an Operator Interface on the manufacturing floor. With a Die-cast flat-sealed front with SGCC Housing, IP65 compliance, numerous mounting options and the most I/O expansion flexibility out of any Advantech all-in-one Panel PC, the Industrial Panel PC provides the durability required for harsh environments on the factory floor. With a widescreen and multi-touch option, optimal CPU, RAM, storage and optical drive accommodations, PCI/PCIe expansion capabilities, a plethora of USB, COM, LAN & Video I/O options and a healthy appetite for working 24/7/365 anywhere on the Manufacturing floor, the Advantech IPPC Series is the be all end all of Industrial Panel PCs. I hope you enjoyed my updated look at the 5 Types of Industrial PCs that Provide Ultimate Performance on the Manufacturing Floor. My goal was to provide furthered insight into some of the more prevalent options currently available to you. As always, if you have any questions, feel free to contact me at 800-830-9523, ext. 126 or via email at Jeremy.Miller@L-Tron.com. Jeremy Miller is L-Tron’s Industrial Automation and Advantech Product Specialist. Jeremy is highly trained and brings over 15 years of experience in the industrial control,data acquisition and test & measurement markets. Jeremy holds Advantech certifications in: Industrial Platform, Industrial Operator Panel, Automation Controller &I/O, Industrial Communication, & Automation Software. Jeremy can be reached at (800)-830-9523 ext 126; jeremy.miller@L-Tron.com.